The CPU and videocard are somewhat locked in, I dont want less performance there since I want a future proof system if I want to stream. I've read that the 2700x is ideal for that, and much cheaper at my country than a 8700k. I also like to multitask so It seems like the right buy. 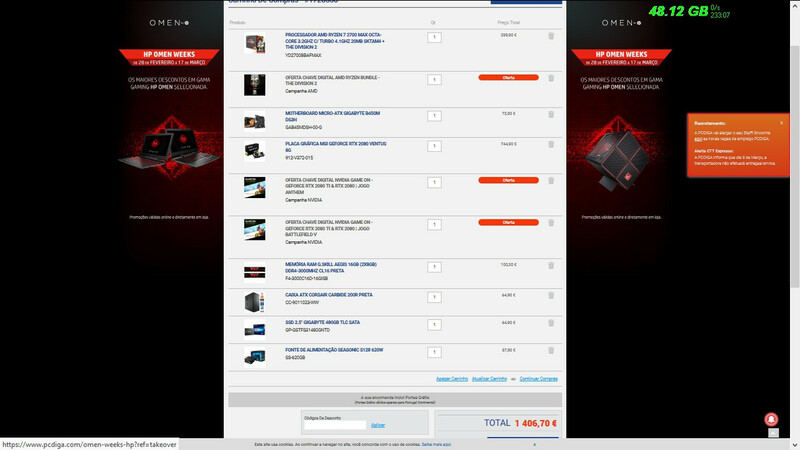 Am I going wrong with any of the other components? I'm not really sure about the power supply, is 520W enough? A gold one is about 30% more expensive, but it's an investment I can make if it really makes a difference. Should i get the Tomahawk board instead of this one? It's a bit more expensive and I'm really trying to keep things in my budget atm. My last question is how easy would this be to build? I mean, would it be connecting all the components and cables together and power up? I see some people having BIOS problems and whatsoever, and I really don't know how to troubleshoot that. I'd really love your guys help and suggestions, thank you! It's around 1500€, i can go to maybe 1550, but I want to spend less than that if possible. Please can you state which country you live in. Líderes na venda de hardware high-end. Informática, smartphones, portáteis, televisões e muito mais. As últimas novidades Tech disponíveis 24h em PCDIGA.com! Monitor AOC - G2590FX is out of stock in all the sites I was able to search. Don't confuse it for AOC - G2590PX you listed. AOC - G2590FX supports G-Sync and AOC - G2590PX doesn't. I recommend waiting and saving for it. Save bit more to get no compromise build. Don't get confused between the two monitors and get AOC - G2590FX. That build doesnt look very well balanced. Rtx 2080 seems like a waste within my budget since I only want to play 1080p. Also both the px and fx are gsync compatible, you will find that with a simple google search. They both are the same monitor, only the stand changes. Initially it was not supported. Good that it got G-Sync support. Gaming at 1080p 144Hz RTX2080 will be better suited for many games. Final decision is yours to make.